The Wright Brothers made their first powered flight in 1903. Soon after, a new dance was born, presumably influenced by this remarkable technological advance. It was called the Aeroplane Waltz. Several composers created musical tributes to the Aeroplane Waltz, including the classic Come Josephine in my Flying Machine, as well as at least two different waltzes entitled, simply, Aeroplane Waltz. One of these Aeroplane Waltzes was composed by Mamie H. Appler, with brief description of the dance by Alice Martin. Another was composed by Chas Konedski-Davis, and included extensive dance instruction on the inside cover by famed dancer and instructor, Joan Sawyer. According to the source webpages, the sheet music was published in 1909. The music may have been composed and copyrighted in 1909, but this sheet music was likely printed at a later date. This is indicated for two reasons. The cover describes the waltz as “Introduced with Great Success at [Joan Sawyer’s] New York Ball Room ‘The Persian Garden. '” The Persian Garden did not open until January, 1914. (Tim Brooks, Lost Sounds: Blacks and the Birth of the Recording Industry, 1890-1919, p. 303) Also, Miss Sawyer sports a dress in her cover photograph which would have been in vogue in 1914, but unlikely to exist in 1909. Mr. Konedski-Davis’s composition, and Ms. Sawyer’s instructions, have been reproduced below. THE RUNNING GLIDE in which the Dancers take the regular Tango position, run four steps, hold two, swaying, then run back four steps illustrating the beginning and Rise (4) of the Aeroplane. THE CRISS-CROSS FLIGHT. Lady stands in front of Gent, hands slightly raised, takes two steps forward to the left, turn, takes two steps forward to the right, hold two beats and resume doubly slow, allowing two beats of the music to each step, swaying as much as possible to illustrate indecision in the flight of the Aeroplane. Ms. Sawyer assumes the characteristic Aeroplane Waltz positioning with respect to her partner on the cover of the sheet music. 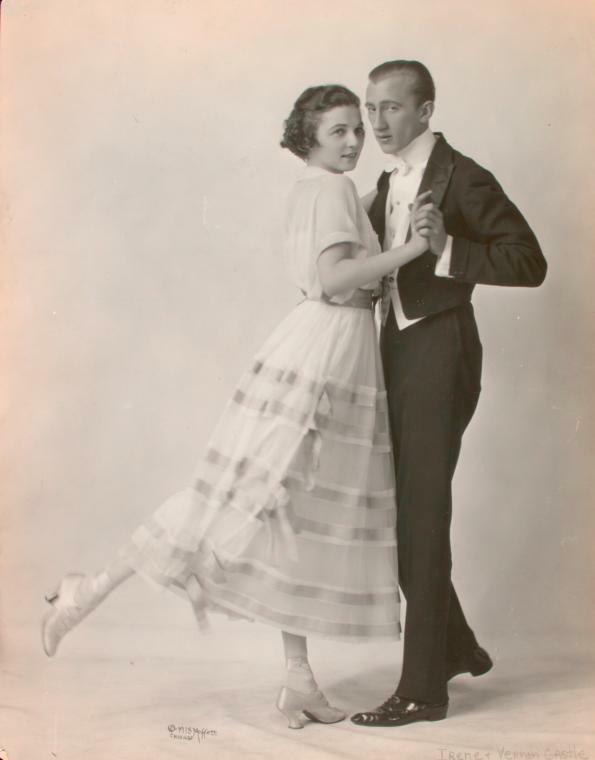 A demonstration of this partner positioning in motion, as well as one couple’s interpretation of the basic Aeroplane Waltz, is available for study in an original video from the era, uploaded on youtube by Sonny Watson. The sheet music and cover image were provided by Johns Hopkins University’s Lester S. Levy Sheet Music Collection. I have yet to find an audio recording of this music. I would love to be directed to one, if such a thing exists.